WyeSoft Password Generator is a simple utility for generating random passwords. The user can choose the minimum and maximum length of the generated password, as well as whether they want it to contain lower case letters, upper case letters, numbers and/or symbols, and the minimum and maximum number of each. The set of symbols allowed in the password can also be easily customised. WyeSoft Password Generator is completely portable and does not require installation. Simply place the .exe file in any folder you wish and launch it from there. By downloading any of these files you are agreeing to our disclaimer. 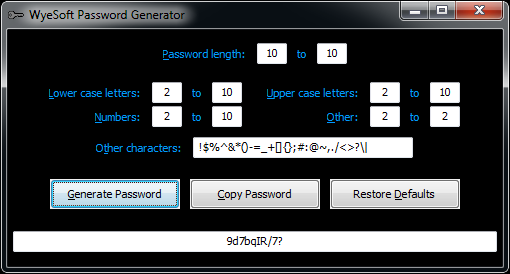 WyeSoft Password Generator v1.02 (freeware) ------------------------------------------- http://www.wyesoft.com/ ----------------------- Copyright © 2016-2017 WyeSoft. All rights reserved. ---------------------------------------------------- Designed and created by Matthew A. Wood --------------------------------------- Originally released 15 November 2016 This version released 7 September 2017 -------------------------------------- Disclaimer ---------- Download and use our software and webtools at your own discretion. WyeSoft cannot be held liable for any harm resulting from the use of our software or webtools or from the viewing of our website content. Introduction ------------ WyeSoft Password Generator is a simple utility for generating random passwords. The user can choose the minimum and maximum length of the generated password, as well as whether they want it to contain lower case letters, upper case letters, numbers and/or symbols, and the minimum and maximum number of each. The set of symbols allowed in the password can also be easily customised. Portability ----------- WyeSoft Password Generator is completely portable and does not require installation. Simply place the .exe file in any folder you wish and launch it from there. Change log ---------- v1.02 ----- - Removed EXE file compression to prevent false positives from certain virus scanners - Fixed bug which sometimes caused program to hang while documentation file was open - Made F1 key display documentation web page if documentation file is missing - Fixed bug which caused lower quality icon to be displayed on taskbar ----- v1.01 ----- - Fixed bug in randomisation, which sometimes caused the same passwords to be generated more than once.